If you've been reading our jewelry series, you've seen the word 'polki' pop up a few times. For those who aren't well-versed in Indian jewelry, we're here for you. polki (n.) - an uncut diamond with one flat side and the other cut to a taper or point. It can be mounted on either side, but usually the shaped (non-flat) side faces up. Polki diamonds, basically, are a type of uncut, naturally earth-mined diamond. 'Uncut' simply means that these diamonds are not faceted, or shaved to have geometric faces. Polki diamonds have the same monetary value all over the world and are fairly popular in the diamond market. They appear often in traditional Jadau and modern Kundan jewelry work. They suit the rough-edged quality of Jadau because they themselves are uncut and aren't as clear or well-manicured as normal, cut diamonds are. That's not to say they aren't as incredibly pure or valuable as cut diamonds. They've been around for a really long time, but I can't find a specific date when they first started being used. Ancient (or at least really really old) Indian jewelry, like Jadau, has been using Polki since the beginning, and the Mughals definitely included a bunch of polki diamonds in their jewelry. Parab-polki meenakar jewarat, or enameled jewelry (Meenakari) made with parab-cut or polki diamonds, is a Jaipuri term used to designate Mughal-Rajput gold jewelry. This jewelry is decorated with Jaipuri diamonds and enamel. 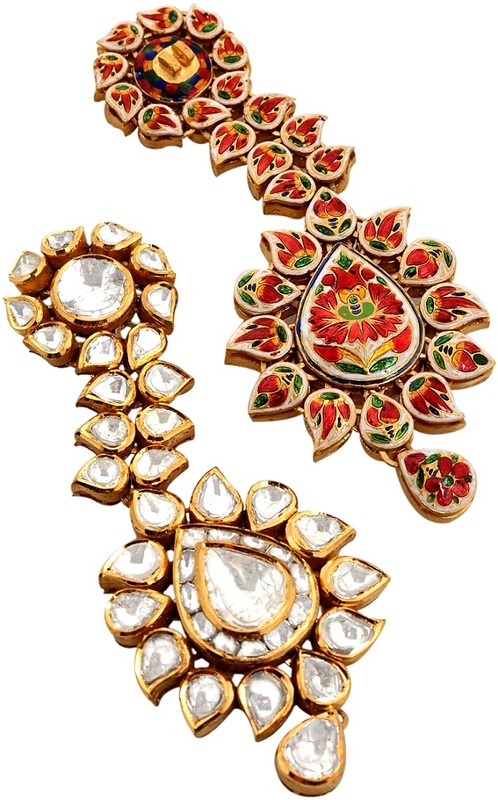 Most Polki jewelry today tends to have enameling on the back, usually pink or red lotuses. 'Polki,' when used colloquially, actually refers to a whole range of uncut diamonds. Villandi (or Bullandi) diamonds tend to be called Polki as they also appear in Jadau and Kundan jewelry. Unlike Polki, which are not shaped, Villandi diamonds have a Mughal cut, or the flat upper pavilion that slopes into a multi-faceted setting. The bit below the setting is irregularly faceted into a vertex. These stones are often removed from Indian jewelry to be cut into Western diamond shapes. This ends up increasing the value of the diamond.